Lighting is one of the most essential elements when designing your home. Without proper lighting, the ambience of your home will be affected, and as beautiful your interiors may be, they will look dull and uninviting. When done right, lighting can help pull all the elements together, transforming your home into a seamless combination of style and functionality. The placement of lighting, types of lights, and light temperature are key ingredients to a well-designed home. We were glad to employ the help of L&H Lighting & Electrical, a one-stop lighting specialist with a wide variety of lighting products in Singapore. Lily from L&H Lighting was especially valuable in our interior designing process, offering valuable tips for the different styles of lighting required for our dream home. We understand first-time homeowners may feel lost at the lighting stage, especially if you opt to work with a contractor like we did instead of an interior designer. Hence here’s some inspirations and tips that we would love to share with you to help you in your home-building journey. The living room is where you welcome your guests and entertain them, hence lighting is key to create the perfect ambience. Modeling our home after luxury hotels, we opted for a mixture of cool light and warm light instead of white light as recommended by Lily. Cool and warm light helps to make your home look cosier and add a luxurious touch. Designing our false ceiling similar to what you see in the picture above, we installed warm cove lighting with T5 lamp tubes such that the light will shine on our feature wall and curtains. Double spotlights with warm lighting were utilised as accent lighting to draw attention to our art paintings. The rest of downlights were cool lighting. The result of our living room is this! Loved the added gradient of the feature wall as a result of the warm cove lighting shining against the wall. Alternatively, if you are going for an industrial theme, you can use track lights to emphasise artwork or a specific decor to create drama and flow. The master bedroom is your personal sanctuary, a place where you spend a third of your day in resting. Getting a conducive atmosphere for restful, uninterrupted slumber is crucial. Likewise to our living room, we had a combination of warm cove lighting and cool down light. Warm undertones create a cosy, intimate air and prepare you better for sleep. Pair cove lighting with a feature wall, and it adds further elegance to the room. At night, we switch off the spotlights and downlights, only turning on the cove light, making it perfect for watching TV or reading a book before bedtime. Another option is to install a dimmable bedroom light, so that you can create varying moods. Finally, a place to hang that gorgeous, elegant chandelier that you have been eyeing all this while! While a chandelier beautifies the dining room, sometimes it may not be bright enough. These days, a dining room is more than a place of feasting and storytelling. For those with a particularly limited space, especially in Singapore’s new homes, this could double up as a home office or study area. To light up the rest of the room, you could supplement with recessed downlights. This pineapple-inspired tropical pendant light can bring a neutral room to life. It has the right amount of colour and character to serve as your dining room’s focal point. Simultaneously, this shaded pendant light will direct the lustre downward while letting some rays out through the sides, creating a soft illumination that is cosy and pleasant to the eyes. Balancing flavours infused with love and memories, your kitchen is where you create nourishment for the body and pleasure for the soul. The brighter the kitchen, the better. You need all kinds of sparkle to peel, cut, chop, saute, and do all the cooking tasks safely. Cool or white ambient light will be perfect for the kitchen. For a rustic retro look, you can use a series of vintage hanging lights all around your ceiling. Whereas for a modern industrial theme, track lights would give you the luminosity required for a sleek look. L&H Lighting has this versatile caged pendant light, which can suit either a retro style or an industrial-themed kitchen. The wire shade barely filters the beam of the naked light bulb. With a few of these strategically lined up on your ceiling, your kitchen will be thoroughly lit. Many more designs are available at the L&H Lighting showroom. Do note that if you have covered shelves occupying most of your kitchen walls, you might need to add some task lighting. 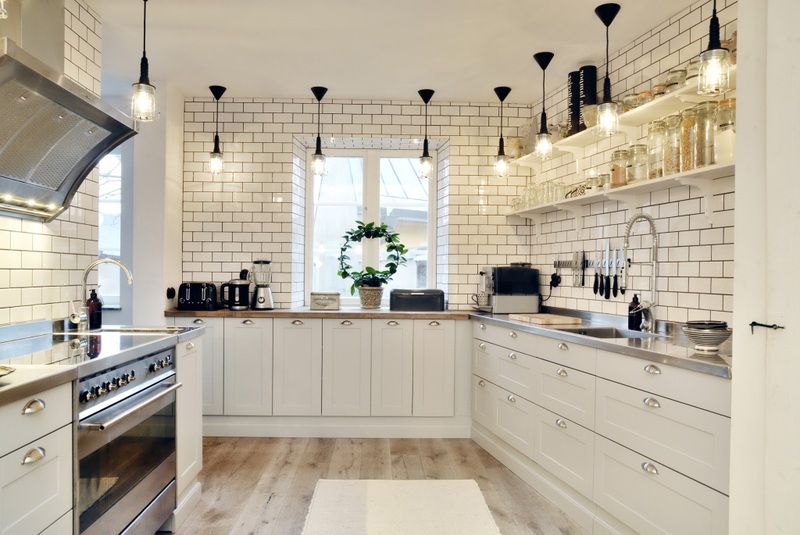 An under cabinet lighting would help address this functionality requirement, and further enhance the look of your dreamy kitchen by illuminating the stunning kitchen backsplash. Your bathroom is the perfect place to unwind after a long day of work – soak yourself in a bathtub with some aromatherapy, or sing to your heart’s content under the rainshower. Whichever your choice, a well-designed bathroom stands to make you feel more comfortable. Plenty of lighting opportunities here – cove and recessed lighting will draw out its beauty, coupling with the usage of cool or warm downlights for a cosy ambience. We went with warm downlights. Initially it felt a bit too yellow-ish when I compared it to our cool light surroundings, but it looked way cosier after spending some time in our new home. Feel free to add cool-toned task lights to help you see better by the mirror when you prep yourself for the next day. Go forth and create your very own calming, stress-free slice of bathroom heaven! Streamlined and distraction-free – that is what a study room or home office should be. Keeping your focus is paramount in this area, which means you will need white to cool light tones to help you get things done properly. A bright and airy minimalist or Scandinavian theme as in the photos above would work well for an efficient workstation. Keeping it simple, we got a basic white 30w ceiling light from L&H Lighting. If you require more lighting, add supplemental task lights such as a table or desk lamp to aid you further. This adorable robot desk lamp is one of L&H Lighting’s most notable table lamps. In true Scandinavian fashion, this lamp features a simple tubular shade and a wooden body that also doubles as a book holder – perfect for bibliophiles out there! With its bendable neck, this desk lamp would be great for reading, even doubling up as a bedside night light. With a wide variety of lighting products, L&H Lighting offers a one-stop solution for all your lighting needs. They even have beautiful ceiling fans for your rooms and balcony, and filament bulbs if you are looking for something creative. Remember, great lighting brings out the best of your dream home’s interior decor! We hope this article helped provide some useful lighting inspiration and tips. Feel free to drop us a note or ask us anything. We’ll be more than happy to help! Featured image credits to Superhitideas. All opinions remain writer’s own. For more information, kindly refer to our copyright & disclosure policy.